By now all of you readers that pop by our blog often know, I am a girly girl. I love makeup, fragrances, products for my skin and I definitely love body wash. I have to have some type of body wash or scrub with me when I'm in the shower or taking a bath at all times. This is one of the only me times I get where I can hop in and pretend I'm at a spa with no interruptions, just me, feeling oh so relaxed. So I like to take my time. There is nothing like washing your body with body wash or scrub and feeling and smelling the goodness that's being applied on your skin as you get clean. 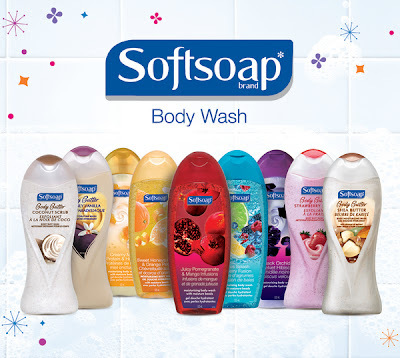 A couple of weeks ago I received an amazing basket of bodywash and scrub from Softsoap. Let me tell you, I was super excited. I think I squealed a little and did a happy dance. I received not one bottle, not two, but nine bottles of bodywash and bodyscrub total. The bottles that I received were from their Fragrance and Body Butter Collection. 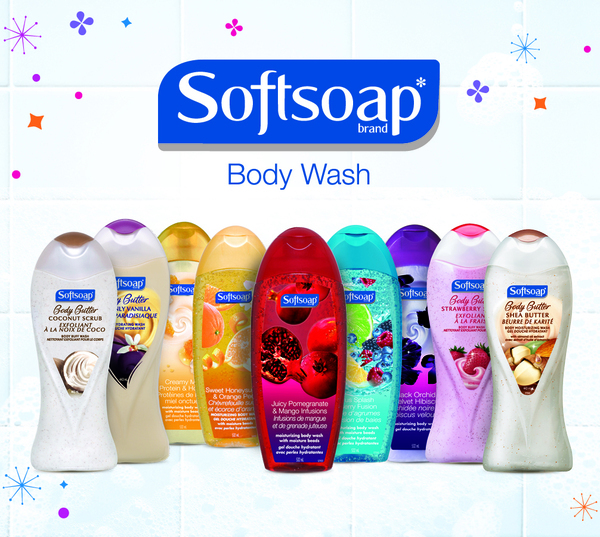 SoftSoap* skin is in™ and making it's way into more and more homes every day. Its irresistible fragrances and ultra-rich formulas will transform your shower into a wonderful experience. Not only am I already a Softsoap fan when it comes to body wash, but I absolutely love their hand soap as well, so Softsoap is a well known brand in our household. Their Fragrance collection has intense fruity and floral scents that will turn your ordinary showers into joyful celebrations. This collection delivers waves of moisture right down to your toes. I haven't tried all of them yet, but I'm working on the Juicy Pomegranate & Mango Infusions bottle right now and let me tell you, my bubble baths have been amazing these last couple of weeks. Their Body Butter collection is sinfully rich and delightfully creamy. Each scent is a thick, sweet-smelling formula that is designed to revive and delight you each time you use it in the shower with naturally-inspired fragrances. My showers have been amazing as well. I've been so relaxed these last couple of weeks and am loving my experience with how great the body butter body scrubs have been feeling on my skin. I've only tried their Strawberry Scrub so far, but am eager to try the others. Boy do I have a treat for you all. One of you lucky readers will be able to win the exact basket I received! This means, nine bottles of delicious smelling, soap lathering body wash and body scrub that will last you for a while. So go ahead, give your skin the moisture it deserves by entering below for your chance to win a basket filled with Softsoap! Disclosure: All opinions are my own. The products mentioned above have been given as part of a sponsored post through our ad network, SheBlogsMedia, for Softsoap.